Today’s customers have huge expectations. They’re informed and empowered–and quick to defect if a service experience goes awry. Companies need to embrace proven strategies to identify problematic interactions, engage managers in outreach, and close the loop with unhappy customers. 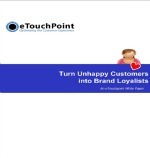 Our white paper “Turn Unhappy Customers into Brand Loyalists” advises you on how to halt defections—and win back customer trust and loyalty. Take prompt action on every negative survey response, halt customer defections, and fortify customer loyalty. Gain insight on how today’s leaders are retaining customers at-risk of churning with closed-loop alerts.